Johnny Bacardi linked to this a week or so back, but in case you somehow missed the unfettered awesomeness of it, I'm linking it, too. 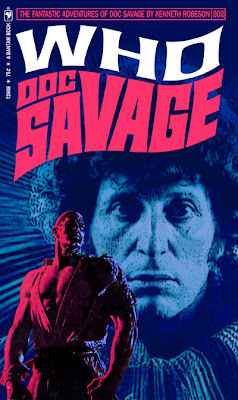 Fantasy Doc Savage pop culture mash-up crossover novel covers designed by Keith Wilson from Blog from the Monsterverse, combining the original Bantam Doc Savage cover designs of James Bama and, well, a whole lot of other stuff. I read a bunch of Doc Savage stories in high school. And yeah, I really, really wish these were real. Be sure to click on the book spines at the top of the page to read the back cover copy on some of these, too. As if the covers aren't enough to make you wish these books were real, the plots all sound terrific.